Leeds United boss Garry Monk accepted his side’s hopes of reaching the play-offs were out of their hands following defeat at Burton Albion, but vowed that the players would keep fighting to the end of the season. 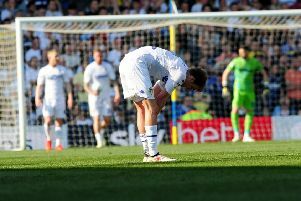 The Whites went down 2-1 to opponents fighting to avoid relegation while rivals Sheffield Wednesday and Fulham both won to leave Leeds’ promotion hopes hanging by a thread. United are now three points behind Fulham, who have a much superior goal difference, and are five behind Wednesday and Huddersfield Town and six behind Reading with two games still left to play. “The defeat feels very raw at the moment, but we still have a small chance,” said Monk. “We are very disappointed with the result, in the second half we were pushing and on the front foot. With just four points from their last six matches Leeds have thrown away their advantage and their play has become increasingly edgy. They had plenty of opportunities at Burton, but a tally of just two efforts on target told the tale of why they now look likely to face another season in the EFL Championship. Two goals in three minutes in the final quarter from Marvin Sordell and Michael Kightly undid the Whites as they lost to Burton for the first time and although Kyle Bartley pulled one back they could not pull anything out of the fire to bring anything home from their travel. They then had the ball in the net on 10 minutes as Chris Wood headed in from close range, but referee Darren Bond mysteriously disallowed the “goal”, possibly for offside. It was stalemate after this with United having plenty of possession, but not really using it and Burton struggling to put much together. Ayling did send a header wide and Kalvin Phillips fired a volley well over, but it was no surprise it was still goalless at the break. The game continued in the same manner into the second half with the hosts seemingly happy to see out the game for a point. But it burst into life just past the hour mark when Charlie Taylor, back in at left-back, produced a good run and cross for Leeds, but Hernandez missed a decent chance as he could not direct his header on target. Pontus Jansson then headed narrowly wide from a Hernandez corner. However, in the 75th minute it was Burton who scored as Sordell turned on the edge of the box and fired low past Rob Green. It quickly got even worse for Leeds as Sordell then went on a good run and set up recently introduced substitute Kightly, who made it 2-0. Undeserved the lead may have been, but the fact was that the Whites had not done enough in a game they really needed all three points from. They did swiftly pull a goal back when skipper Bartley turned the ball in from close range Wood had flicked on a cross, but it proved too late. United went for broke in the closing stages and looked certain to equalise when the ball fell for Kemar Roofe six yards out, but the £3 million forward, who has only scored three goals all season, fluffed his big chance. Late on it was Burton who could have scored, but Luke Varney was denied by Rob Green. It did not matter as the home team were able to celebrate a vital three points and Leeds were left looking at another year in the Championship. Burton: Bywater, Brayford (McCrory 79), McFadzean, Turner, Flanagan, Akins, Christensen, Mousinho, Irvine, Dyer (Kightly 75), Sordell (Varney 85). Leeds: Green, Ayling, Bartley, Jansson, Taylor, Phillips (Pedraza 66), Vieira, Roofe, Hernández, Doukara (Sacko 61), Wood.